Illusion and reality: Expanding paper sculpture heads that disturb and delight. This is not an illusion per se, but I have to admit the first 30 seconds or so did freak me out. Weeeeeeeeird. Those are actually paper sculptures by Chinese artist Li Hongbo. The paper leaves in the stacks are connected, a bit like honeycombs. They start off as a block, which can then be carved into different shapes just like stone. 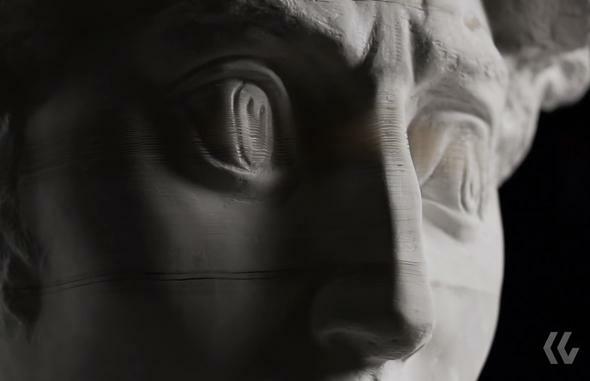 Hongbo sculpts them into beautiful classical heads, and then when you pull on them, well, you get that bizarre video above. The first two segments are pretty nifty. I wasn’t sure what to expect, and I thought for a moment this was going to be just an optical illusion, not actually motion of the medium itself. This was strongly reinforced in the second shot, where the camera moves down as the head is pulled up, making it look like the changing perspective is what’s causing the change we see. But it really is because the head is physically being pulled apart! I suspect this is so engaging because of the “uncanny valley” effect, where artwork depicting faces looks almost—but not quite—real. It disturbs us. That’s why simple cartoons like Homer Simpson look just fine when we watch the show (the drawings are flat and not at all realistic), but when it’s turned into a 3-D photorealistic picture, it will haunt your nightmares for all eternity (seriously, you may not wish to click that link unless being drastically and soul-clenchingly disturbed for the rest of your life is something you truly desire). In this case, the heads look like classic Greek sculptures, which are clearly representative of humans, but lack the depth of reality, so they are beautiful, not disturbing. When they become distorted as they are pulled apart, accordion-like, the eyes get stretched, the ratios of various features distort, and some atavistic part of our brain is activated. We’re repulsed. The creepy music only adds to the effect. I often wonder what will happen when humanity meets its first true alien—not just a planet covered in single-celled goop but an actual complex creature from another world. Much of my own thinking has been triggered by a voracious consumption of science fiction, which unsurprisingly covers this topic extensively. Assuming we can even recognize a life form as being alive, will its shape repel us? If it looks something like us, but not quite like us, will we be betrayed by our own brains, tripping some ancient reflex of loathing? I hope not. I can hope that by understanding our own minds better we can overcome this fear of “other.” In all the books and stories I read about first contact, though, I don’t think any used the idea that our own art might help us if and when we do meet our kin across the stars. I think it’s an angle worth exploring. Tip o’ the chisel to my friend Lucky Yates.